I finally bought one of the items from the online store, and it goes without saying, retargeting was instrumental in pushing me towards the purchase. Through this post, I will talk about retargeting and how you can use it to boost your conversion rate. I’ll start with an introduction to the concept. Retargeting involves displaying personalized ads to your website visitors after they leave your site. Retargeting gives you a chance to bring back your lost audience. Retargeting starts with identifying individuals who are interested in your products. Next, these individual are regularly served with ads about similar products — on websites that they later visit. The ads appear frequently in front of the individuals, prompting them to make a conversion. The practice was initially adopted by eCommerce players as a means to recover their bounced traffic and abandoned carts. But now, it is popular among online B2B marketers as well. B2B marketers use retargeting to always remain in sight of their leads. ‘Dynamic Retargeting’ is an even more personalized form of retargeting. Here, individuals are shown ads that display the same products which they have viewed earlier. Retargeted ads are also being increasingly served through the mobile channel. This practice is referred to as ‘Mobile Retargeting’. Various studies have shown that retargeting ad campaigns result in a steep rise in conversion rates. They can increase ad responses by up to 400%! Further, retargeted ads can not only influence visitors for a direct response, they can also improve brand awareness and recall. The average clickthrough rate for retargeted ads is 10 times greater than the clickthrough rate for regular ads. Website visitors who are served with retargeted ads are 70& more likely to make a conversion. With retargeted ads, 26% more visitors return to a site and complete the checkout process. Retargeting can lead to a 147% higher conversion rate, when used in combination with prospecting. So Why Does Retargeting Work? Almost all online shoppers who visit a website for the first time, leave without taking any action: Only 2% of website visitors convert on their first visit. This means that out of your website’s total first time visitors, a whopping 98% aren’t yet convinced to buy your offering. Retargeting helps you win over the 98%. Retargeted ads are served to people who already know about your brand, and have a higher chance to yield conversions than ads that are served to random web users. Also, retargeting ads often carry some sort of incentive for the users. These incentives push some of the users to return to the website and convert. 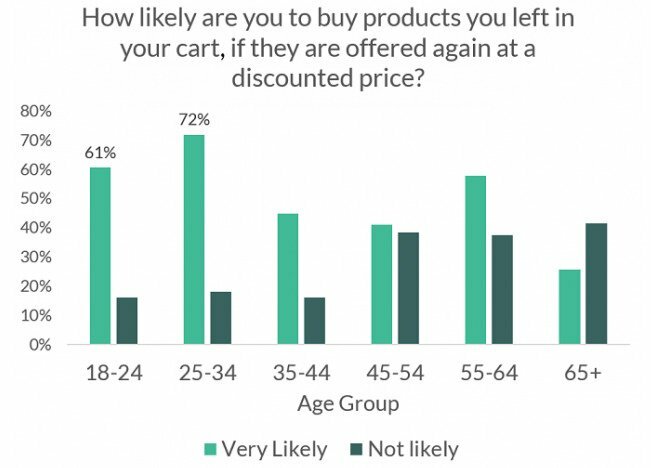 According to our eCommerce study conducted last year, a massive 54% of online shoppers said they will purchase products left in their cart, if they are offered again at a discounted price. Here is an elaborate read on why retargeting works. Let’s see how the most basic form of retargeting — Site Retargeting — works. When a user visits a retargeting-enabled (RE) website, a cookie is placed in the user’s web browser. The cookie stores information about the user’s visit to the RE website. Whenever the user appears on other websites that are a part of the RE website’s ad network, the cookie lets the RE website know. The RE website then presents that user with a retargeted ad, persuading them to return back and make a conversion. Email Retargeting: Serving ads to people who open (or interact with) your emails. You can segment the audience on the basis of different email types that you send — introductory emails, product-info emails, promotional email, etc. Search Retargeting: Serving ads to people who search for specific products on search engines. Social Retargeting: Serving ads to people who interact with your posts on social media (through likes, tweets, comments, and shares). You can segment the audience on the basis of different post types and the different actions users have taken on the posts. Retargeting has been around for a few years now. During this period, many retargeting tools have established themselves as leaders in the industry. Google’s Remarketing: The retargeting service offered by Google is called Remarketing. The Remarketing tool is a part of the Google Adwords platform. Remarketing leverages Google’s display network of more than a million websites and mobile apps. You can use the tool to create standard and dynamic retargeted ads. Remarketing offers easy segmentation of your overall traffic. The tool allows you to display ads to general website visitors, mobile app visitors, and users that interact with your youtube channel. For beginners in the retargeting space, Remarketing is considered as the go-to tool. Retargeter: Retargeter — the company — works exclusively in the retargeting space. Their tool claims to serve your ads to users across 98% of the whole web. With Retargeter, you can display ads to your website visitors even on their Facebook feed. You can use the tool to target your your ideal audience based on various parameters like demographic, geographic, behavioral, contextual, interest, and intent-based data. Adroll: Their website description says “AdRoll is the top retargeting platform.” And the long list of their reputable customers certainly backs this up. Still, Adroll might be best known for their ‘unparallelled ROI’ claim which says that their customers earn (on an average) $10 for every $1 dollar they spent on retargeting. Using their tool, you can place your ads across leading display networks and ad exchanges including Google, Yahoo!, AppNexus and OpenX. Adroll also features Liquid Ads — their dynamic retargeting ads services. Perfect Audience: Perfect Audience is a great tool to persuade your lost visitors through a multi-channel approach. The tool offers seamless retargeting, which is carried out through web, mobile, Facebook, Twitter, and more. Perfect Audience’s integration with Hubspot allows you to align your retargeting campaigns with your Hubspot activities. By scanning through your landing pages and smart lists on Hubspot, Perfect Audience builds a relevant user-list for you to retarget. The tool provides easy segmentation of visitors based on various user-behavior rules. TapCommerce: The TapCommerce retargeting tool has been acquired by Twitter. It specializes in Mobile App Retargeting. TapCommerce has a great reach among mobile users: It handles more than 40 billion ad impressions every day, across more than 50,000 iOS and Android apps. Chango: Chango retargets website visitors using ‘intent signals’ from multiple sources and not just from the basic website data. It captures the intent data through billions of searches, and behavioral and contextual data signals. Chango claims that the intent-based retargeting effects more conversions than regular retargeting. The tool’s range of features include fraud prevention, brand safety, dynamic creative, and more. So you have decided to incorporate retargeting in your marketing plan. You have also finalized the retargeting tool to execute your ad campaigns. 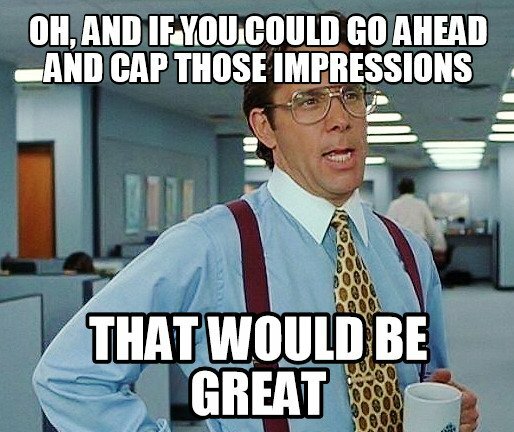 Now it’s time to kick-start your first retargeting ad, right? Your retargeting ads, if not planned properly, can lead to wastage of money and even harm your brand image. Segment your audience and serve personalized ads: Effectively use demographic, geographic, and intent-based attributes to segment your audience. Serve each audience segment with contextual ads. You can also segment your audience based on where they lie in your purchase funnel. For instance, if some users have only visited your home page (top of the funnel), you can show ads that focus on building brand awareness — highlighting your USPs and differentiators. And if users have carts abandoned on your website (bottom of the funnel), you can show ads that offer incentives — in the form of discounts — and lure them for a conversion. The more relevant your ad is for your users, the higher its chances are for a conversion. Set frequency limits for your ads: If your website visitors encounter your ad on almost every website that they visit afterwards, they are bound to get agitated. It’s safe to say that it will negatively impact your campaign’s conversion rate and your brand value. You need to identify the fine line between not visible enough and too frequent — for each user segment. Retargeter recommends displaying 17-20 ads per user per month, but you can always test for the number that works best for your ads. By setting up a frequency limit, you can ensure that your audience is not over-exposed to your ads. Avoid displaying your ads to users who have already converted: Serving ads to users about products which they have already bought, will (almost) never lead to a conversion. Your customers will be annoyed and the money spent on these ads will be wasted. Your existing customers, however, can still be a part of your retargeting campaigns. Through upselling and cross-selling your related products to the customers, you can maximize their lifetime value. A/B test your ad copies: The design and content of your ad are major factors that influence the mind of a viewer. To know which variation leads to the highest conversions, it is important to A/B test. A/B tests help you take data-driven decisions on ad copy, ad design, call-to-action, and ad placement. You can also test different types of incentives offered through your ads, and find which one is the most popular among your audience. If you think that I have missed anything important, please post it in the comments section below. While you said about email retargeting, the tools presented only cover ad retargeting. Externally retargeting can be reached on mobile through push notifications, email and ads. Disclosure: I’m founder of http://vibetrace.com, a complete marketing automation solution for ecommerce.